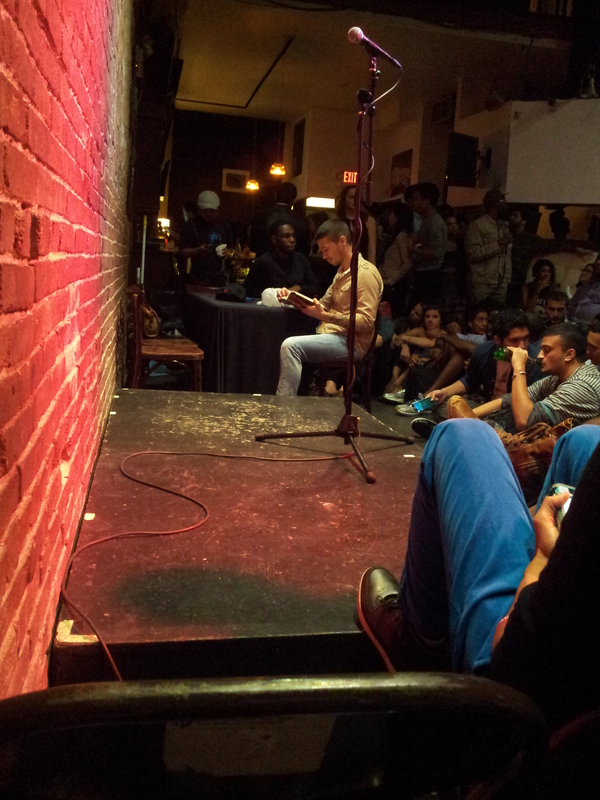 The Nuyorican Poets Café is one of the world’s beating hearts of performance poetry. Founded by a pioneering group of Puerto Rican artists and activists in 1973, it became a vital hub for artists of colour whose work was not accepted by mainstream industries. It’s now housed in a former tenement on the Lower East Side, in the middle of a strong Nuyorican cultural community in Manhattan. Along with the Uptown Poetry Slam, the Nuyorican Poetry Slam is one of the events that made slam a huge international artform. So when it came to organising a North American poetry tour, this is absolutely where I had to go. I’d been told to queue an hour early if I wanted to join in the Wednesday Night Open Slam, and when I arrived at the door at 8pm there were already two other nervous poets jogging from foot to foot. We early birds quickly formed a queue community of slammers — there was me, a touring poet from Scotland; Liana, originally from Latvia and now studying nursing in New York; Kevan, a regular on the New Jersey scene who also teaches meditation; and Phil, a high school student in New York. We were all slamming here for the first time, and excited to be there. Quickly the queue grew behind us as we joked and encouraged each other and swapped poetry stories. The slam, hosted by the amazing Jive Poetic, was unlike anything else I’ve ever been to — or rather, it was like all the slams I’ve been to, only so much more so. The crowd was completely packed once the whole queue had been squeezed in, and needed no encouragement to yell and cheer and finger-snap and boost every performer. Any judge who dared give lower than a 9 to a poet was viciously booed. There was a diversity of styles, but more work rooted clearly in hip-hop, and more work in the confessional slam style than you usually see in the UK. As an open slam, there were the same mix of nervous first-timers and pros throwing in their hat and total surprises. There were also, as I’d expected, way more writers and performers of colour, and the politics of voice and community ran powerfully through the night. It felt like a political event as much as an artistic event: or, to put it better, in this poetry slam art and politics were intertwined and extricable. Here slam was clearly about taking voice, taking the stage, speaking out and being heard. I decided to hit the slam with as full on a burst of Scots poetry as I could. It was wild. I’m used to performing Scots to local audiences where the language and the references are familiar — I can predict where the laughs will come, the mmhmms, the cheers. Here I was consciously performing my own oral poetry for a community that wasn’t mine. Performance-wise I probably went off the rails, but in a really fun way: the audience were bemused, shocked, delighted, didn’t know what to make of it but loved it, laughed and cheered in strange places, and roared whenever they caught a reference that meant something. It was great to be with them, and have them with me; the applause that comes after a slam performance, and the out-breath, and the exhausted collapse into your seat — these are some of my favourite feelings in the world. Said Jive Poetic afterwards, “I’ve never seen an audience pay attention That Aggressively.” I’m not sure I’d do it again — or maybe I’d love to do it again and make it really work. I came back again on Friday to watch the invitational slam — win a Wednesday night slam and you can enter a Friday, win a Friday and you can be part of the run-offs for the Nuyorican Slam Team that heads to the National Poetry Slam. This time you have to arrive at least an hour early just to get in the audience. In the queue, I chatted with Lisa Mary MacNair, a Boricua/Scottish wordworker who used to work as a Literary Manager at the café. She remembered the area when it was much more strongly Puerto Rican — now rising rents and gentrification have changed the demographics of the Lower East Side dramatically. The Nuyorican owns its building, or it might have gone the way of The Living Theatre or the Bowery Poetry Club, both forced to move, the former now without a permanent venue. Whereas before the Nuyorican was at the geographical heart of its community, now poets are travelling from all across the city to perform there. At the start of the slam, host Mahogany Browne gave shout-outs to each Borough — Bronx and Queens got by far the biggest cheers. I started thinking about the importance of arts venues to local communities, and how big economic changes can affect the kind of poetry we’re doing. When I was working at Govanhill Baths the writing I was making and supporting there came from that community, but when I’m just writing alone sometimes my poetry feels adrift. Again there’s a politics here: when a community is denied a loud voice in the mainstream, it’s vital it has spaces to take a voice for itself, and that’s something that has to be protected in an era of gentrification. If I thought the Wednesday Slam was astonishing, the Friday Slam doubled down. On Wednesday the crowd filled all the seats, the bar and the balcony; on Friday they sat on every inch of floor, squeezed up against the walls, all aching for a poetry party. And the Wednesday Slam seemed sedate in comparison — this night was as much of a party as a slam, with crowd-stoking hosting, intense DJing, a dance-off in the breaks. It kicked off with a brilliant feature set from Angel Nafis, and a stunning sacrificial poem from Frequency (who won on Wednesday), before heading into the main event: three poets performing three poems each, competing for a slot on the Slam Team. A thread of politics and identity ran through the poetry — but the poems were often about family, or love, or faith; rather than being bald statements of politics, they were poems about life informed by identity and radical community. What struck me most was how much the poetry was happening in collaboration with its audience. Most of the audience had been to slam and the Nuyorican before, and knew not just what to expect, but what it wanted: it wanted righteous truths, but it also wanted surprises; it wanted to be in political community with the performers, but it also wanted to be challenged and shocked. It wasn’t just a slam night but a slam audience. This made sense of one thing I’ve always found deeply weird about slam in Scotland: while traditionally and in most of the world slam is judged by randomly-selected audience members, in Scotland most slams have selected judging panels. But in Scotland I don’t think we’ve built a committed audience for slam, and slam isn’t urgently emerging from a community or artistic scene: our slams are great, but they’re a novelty, a crowd-puller and an entertainment rather than something that’s necessarily about our community and our politics. They’re also, in the main, very very white. Maybe our resistance to audience judges is that we haven’t yet built an audience that’s part of the poetry. Having random audience judges means trusting your audience, and in Scottish slam we don’t know who the audience is, so instead we place our trust in selected judges. I think that maybe one way of building a slam audience is to bring audience judges into the centre of it — but another is to make our slam more diverse, and reach out to the communities who aren’t performing, who we can support in taking their voice.